Trying to analyse the interim report on the Tax Working Group (TWG) is like trying to review an entire All Blacks game, but at the half- time mark. With so much still to be finalised, Sir Michael Cullen and his colleagues are going to need all the All Blacks’ fabled finishing skills to get a coherent, fiscally neutral package together by the February 2019 deadline. This morning at a special briefing, the assembled media and business types did learn what the TWG is not so keen on. There will be no cut in company tax. Three previous rounds of company tax reductions, Cullen reminded us, had produced no discernible lift in productive investment. There will be no GST exemptions for say, fruit and vegetables, and no targeted taxes like a tax on sugar laden fizzy drinks. Socially desirable ends can be better served, the TWG felt, by other means than extra taxes. Purely by way of illustration, Cullen cited the options of raising the excise tax on sugar itself, or of regulating the acceptable levels of sugar content in the fizzy drinks in question. Not that they recommending either at this point, OK? Driven by the desire not to pile yet more socially regressive taxes onto the unhealthier habits of the poor, the TWG was also plainly disinterested in raising tobacco taxes any further, but it did show some interest in devising more rational ways of taxing alcohol. There was a whole subsection on environmental taxes – tourism is a land-based “natural” industry akin to farming, Cullen pointed out laconically, in that people come here for the scenery, not for the culture. A waste disposal levy may be on the cards. A comprehensive tax on land is out, and so is a wealth tax. And from day one, the TWG terms of reference had prevented any capital gains taxes being levied on the family home and/or on the land on which it sits. All of which raises the biggie of what sort of comprehensive, fair and efficient capital gains tax the TWG might actually have in mind. Usefully, Cullen reminded us that New Zealand stands alone among developed nations in having such a narrowly based tax system (heavily reliant on income taxes, levied on wages) in which the income from various forms of capital gains is all ignored by the tax authorities. All other countries see the need for a wide ranging capital gains tax, not only on fairness grounds but also as a tool to channel investment into more productive directions than housing speculation. Which raises the question, Cullen asked rhetorically, whether we’re smarter than everyone else in not imposing a comprehensive capital gains tax, or dumber than everyone else in not being able to figure out how to do it. At this point, the TWG is still publicly agnostic about how the capital gains question should best be tackled. It will not be recommending a separate tax on capital gains along the lines commonly found overseas ; but it would be seeking instead to address the fairness/ administrative efficiencies involved, within the framework of existing tax structures that have to do with income. Beyond that fairly opaque point… and stepping back for the big picture view, the TWG report cited two potential ways it could proceed: (a) by extending the tax net to include gains on assets not currently taxed or (b) taxing deemed returns from certain assets, which in accountancy speak is called the risk free rate of return method of taxation, or RFRT. To pile uncertainty upon opaqueness… whichever route the TWG chooses, its recommendations will be advisory only, and will not be binding upon the coalition government. Fortunately, the Welfare Expert Advisory Group is also due to report back in February 2019, so the tax treatment of welfare benefits (and the adequacy of those benefits) can be brought together by the coalition government at the same time. As with all such interim reports, the more interesting stuff was in the fine print, and in the asides. During his preamble, Cullen mentioned the need to align any proposed changes with where changes to the structure of work were headed and – in his view at least – overseas precedents on the growth of the gig economy were not necessarily relevant to our economy. What we’re seeing though, is a seismic socio-economic shift away from a situation where PAYE deals satisfactorily with almost everything to do with the treatment of work income, to a situation where -for tax purposes, the IRD will have to put far more energy and resources into tracking the income earned by so called “self employed” contractors. 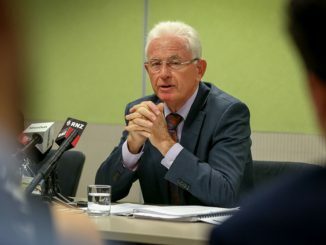 When I questioned Cullen on the privacy implications of this extension of IRD powers, he conceded that there would be privacy implications requiring consultation with the Privacy Commissioner – but also indicated that the trade-off between privacy and the IRD’s need to accurately assess income was nothing new. For clarity’s sake then, what was envisaged in the extension of those existing powers? In reply Cullen’s TWG colleague Geoff Nightingale also traversed some of the existing IRD powers related to compliance and disclosure, before saying that the platforms in questions would be those operated by offshore technology platforms like Air B’n’B and the ride-sharing company Uber. Again though, the exact nature and scope of those extended powers (and the compliance requirements envisaged) are still something of a work in progress. Clearly though, the wildly varying income earned by “self employed contractors” is going to come under greater IRD scrutiny, with platform operations being required to comply with new regimes of greater disclosure. Given the below minimum wage pittances involved for some Uber and Air ‘n’B operatives, the TWG is going to have to tread carefully, if it really aims – as it claims – to balance fairness to taxpayers and privacy rights against the administrative cost of recouping the revenue involved. In that respect, the report’s linkage of the technology platforms to international money-laundering isn’t very helpful. If it can find other ways of dealing with the obesity caused by fizzy drinks, it can surely find other ways than the tax system of dealing with the criminals and terrorists involved in money laundering. On the upside, the TWG has a once-in a generation opportunity to reform the tax system. It has clearly articulated the need to address crucial issues of fairness. Taxing wages rigorously while virtually ignoring other forms of wealth generation is not sustainable. Nor is it al that credible to invoke the administrative cost of targeted taxes on income and wealth as being prohibitive and/or vastly inefficient. After all, on the welfare side of the state’s ledgers, successive governments have made a fetish out of micro-targeting welfare benefits, no matter how costly the administrative and compliance costs of doing so may be. Arguably, the money would have been far better spent on paying more in benefits to those in need than on compliance. Perhaps the TWG should just focus on devising a system that will deliver fairness, and leave it to the government to decide on the balance to be struck between what’s desirable, and what’s worth the candle, when it comes to compliance. We don’t want “efficiency” to become, once again, the enemy of a just outcome. The TWG isn’t into retrospective measures and neither – despite an image associated with nostalgic imagery – is Lana Del Rey. In her hands, nostalgia is a weapon as often as it is a crutch, or a consoling immersion back in the good old days of yore. In the past month she has released two tracks as good as anything in her back catalogue, with one of them being unlike anything she’s ever done before.